A natural and cultural unforgettable spectacle. The estuaries of Ibera, the most important wetland in Argentina, a sanctuary for wildlife. The Falls with his dazzling heart of basalt and the largest in the world waterfalls surrounded by the lush jungle. Jesuit Mission of San Ignacio Mini, a real historical monument with over 460 years of existence. Includes accommodation with full board in Ibera and in a three-star hotel with breakfast in Puerto Iguazú (Double Bed Room). Subject to availability. Departure from Posadas. Ask for other transfer. Day 1: Transfer from Posadas city to Colonia Carlos Pellegrini, in Corrientes Province. Accommodation at the lodge. Dinner. Day 2: Breakfast. 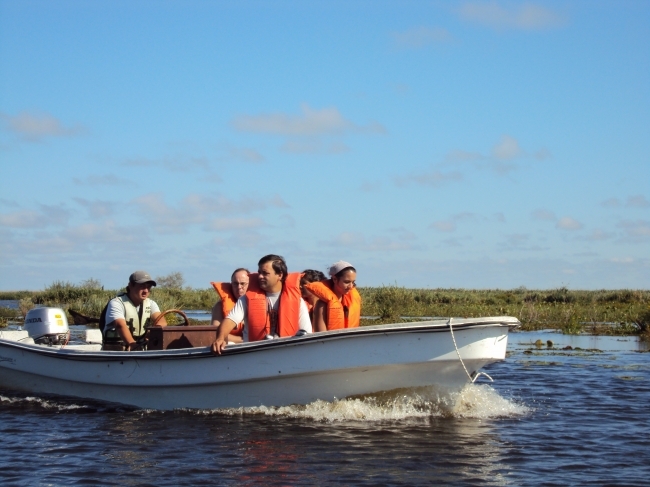 Navegation through the marshes (Corrientes stream) for wildlife mapping. Lunch. Visit to the Interpretation Center. Dinner. Day 3: Breakfast. Navegation through the Miriñay creak for wildlife observations. Lunch. Walk around the estuaries. Dinner. Day 4: Breakfast. Departure to Puerto Iguazú visiting the Jesuit Mission of San Ignacio Miní and Wanda Mines. Accommodation in Puerto Iguazú. Day 5: Breakfast. Tour to the Argentinean side of the Falls. Day 6: Breakfast. Tour to the Brazilian side of the Falls (HD). Check out and transfer to the airport.